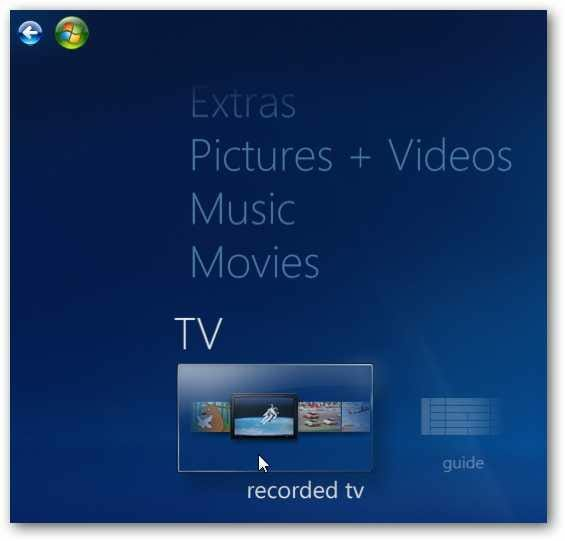 If you’re a new user to Windows 7 Media Center you know it can act as a DVR and pause or record Live TV. 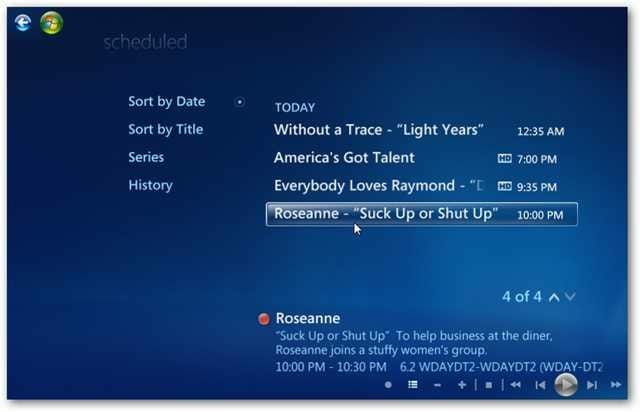 You can set up a schedule for it to record your favorite TV programs as well. To setup a schedule to record live broadcast TV shows open WMC and select TV then Guide. When the guide is displayed browse through it and when you find something you want to record, right-click it and select Record. Go through the guide and schedule what you want recorded throughout the week. After something is set to be recorded a red record button will appear next to the show. One thing to keep in mind is you can only record one program during a particular time slot if you don’t have multiple tuners on your system. If you try to schedule two shows at the same time you’ll get the following screen. You will need to select the one you really want to record. If you want to record two channels at the same time you will need a tuner card capable of it such as the Hauppauge WinTV-HVR-2250. 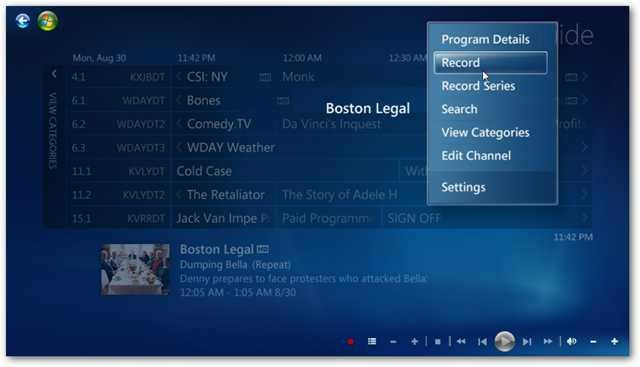 If you want to edit or delete some scheduled recordings select Recorded TV from the main menu. 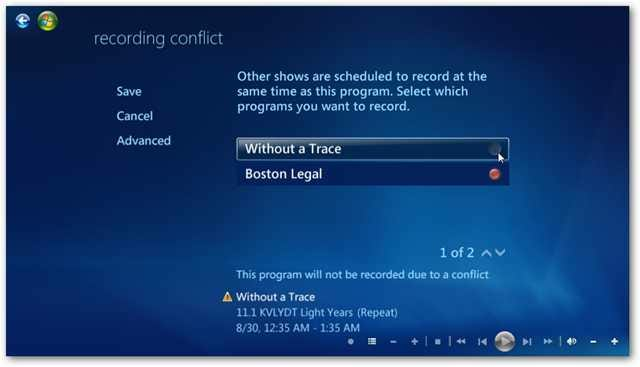 This will bring up a list of your recorded programs. 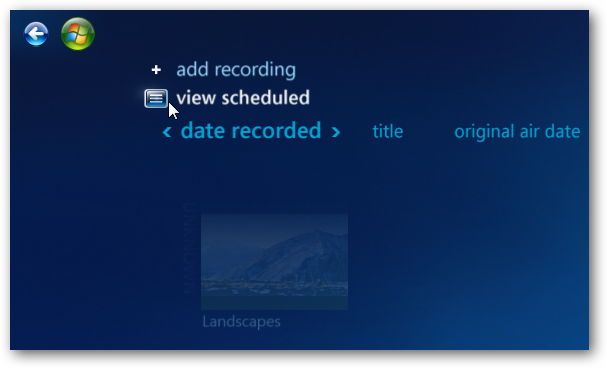 To see what you have set to record select View Scheduled. This will give you a list of what you have scheduled to be recorded. If you have a lot scheduled you can sort by Date, Title, and Series. 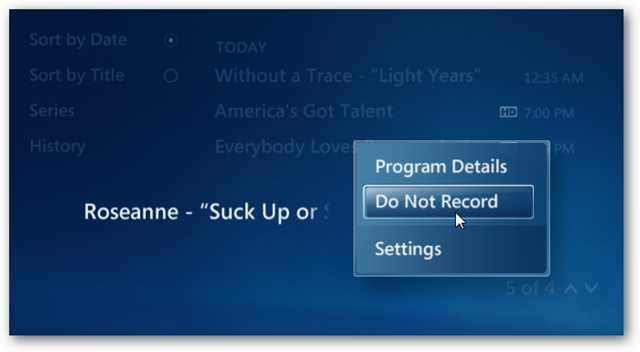 To delete a show from being recorded, right-click on it and select Do not Record. That will remove the TV program(s) from the list. If you go through and set up a lot of shows to be recorded, you might not be sure which ones to not record. 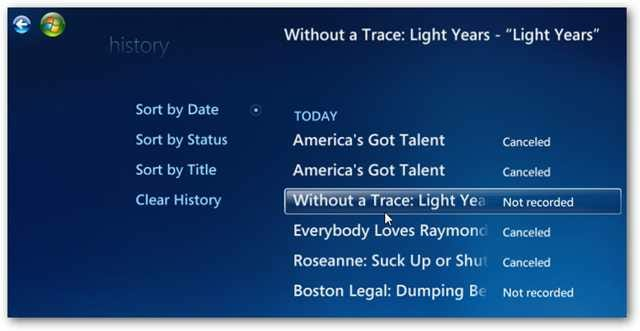 Right-click on the show and select Program Details. 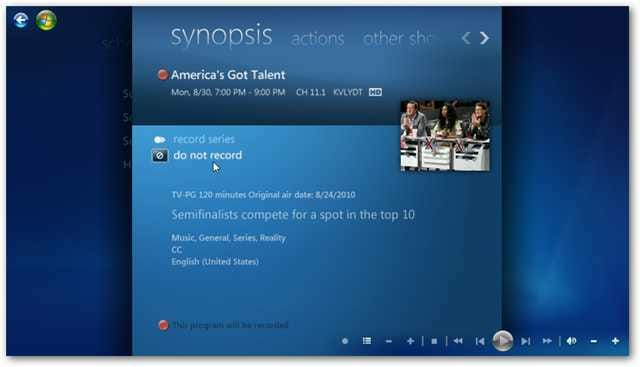 This gives you a synopsis displaying what the program is about, if it’s set to record or not, and you can select to not record it, or schedule the entire series to be recorded. This will help you in making your scheduling decisions. 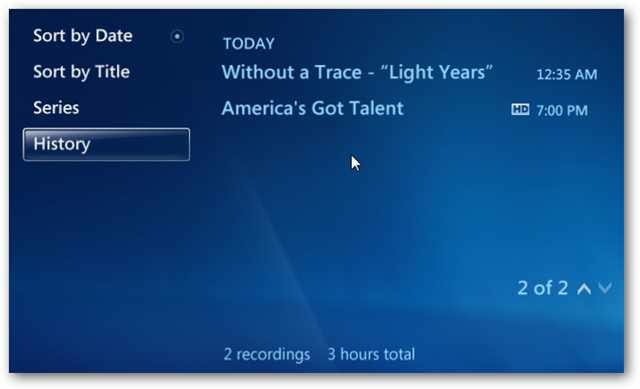 In the History section you can see all of your previous recording activity, it a show has been recorded or not, or if the recording was cancelled. 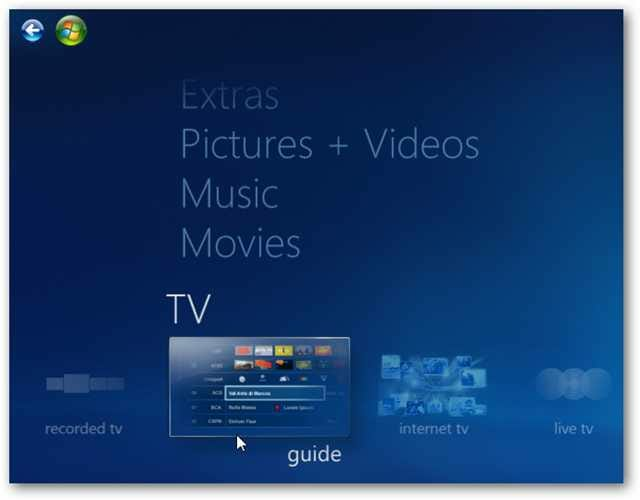 If you’ve never used Windows 7 Media Center to record broadcast TV before, these steps will definitely get you started. 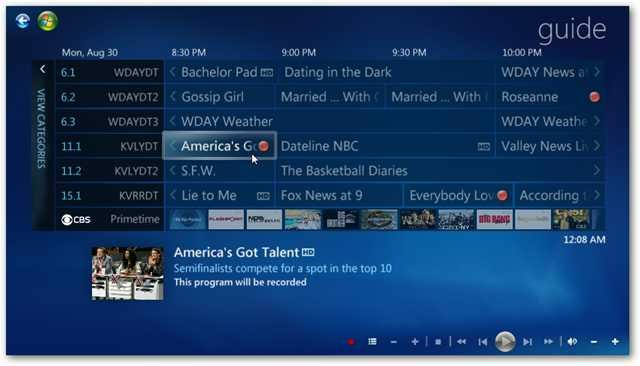 If you want more control over the process check out our article on how to remotely schedule and stream recorded TV on Windows 7 Media Center.